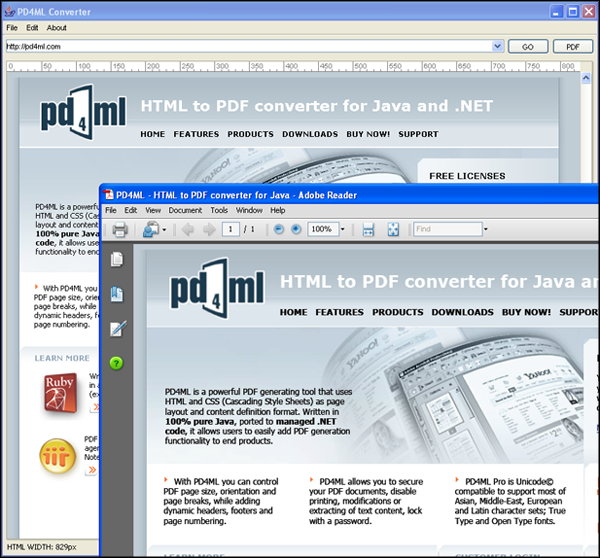 PD4ML is a powerful PDF generating tool uses HTML and CSS as page layout and content definition format. 100% managed code, it allows users to easily add PDF generation functionality to end products. With PD4ML you can control PDF page size, orientation and breaks, while adding dynamic headers, footers and page numbering. PD4ML allows you to secure your PDF documents. PD4ML Pro is Unicode compatible and supports True and Open Type fonts. ...... The rendering engine implements most of HTML4/CSS2 standard features plus a number of custom PDF-generation-specific functions: pagination control, headers/footers generation, watermarking, TOC generation etc. PDF reporting does not require an utilization of complex report generators anymore. You create an HTML/ASP based report with images, charts, form elements and PD4ML does the rest for you. PD4ML allows you to easily embed word processor documents, spreadsheets, and rich media content as attachments to the resulting PDF documents. * Convert an URL or HTML string to a PDF file or byte stream. * Embed and use True Type and Open Type fonts. Qweas is providing links to PD4ML.NET. HTML to PDF Converter 3.6.0b1 as a courtesy, and makes no representations regarding PD4ML.NET. HTML to PDF Converter or any other applications or any information related thereto. Any questions, complaints or claims regarding this application PD4ML.NET. HTML to PDF Converter 3.6.0b1 must be directed to the appropriate software vendor. You may click the publisher link of PD4ML.NET. HTML to PDF Converter on the top of this page to get more details about the vendor.